On the watch market has another chasoproizvoditel – New Orleans Watch Company. I watch the company seems to have no name, or the company is still undecided with their promotions and information about its products circulating in the network is not very active. 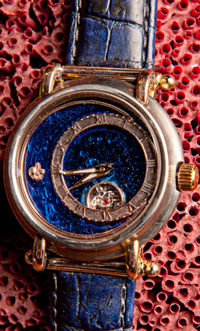 We only know that the clock New Orleans Watch Company carried out strictly in order, and therefore, must be expensive. The company recently introduced several new products, the body which consist of various parts of the material, reminiscent of old furniture. As the representatives of some hours on the clock face New Orleans Watch Company can be pieces of ivory from old piano, found in the remains of houses after Katrina. After this, it is obvious that the world has another company, the master is fond of unusual materials and design. In addition to old furniture it should be noted maritime theme, presented in the news. 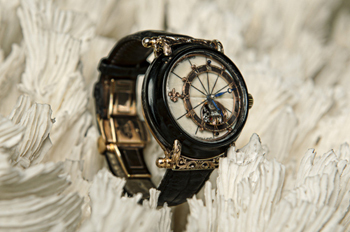 Thus, a model of New Orleans Watch Company dial is offset from the center and it is a symbol of toffee, made of 18 carat gold. The distinctive detail of the new hours of New Orleans Watch Company can be called the structure of arches hours, arrows and other decorative elements of the dial. Note that the head of the new company is a retailer of New Orleans Craig von Bebilon (Craig von Babylon). Mechanisms of new watches – Swiss-made.